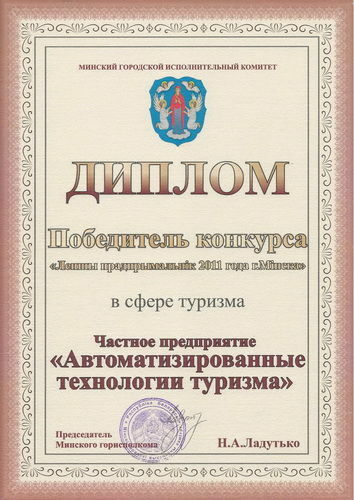 The Belarusian touroperator Private research-and-production unitary enterprise «Automated tourism technologies» specializes in internal and inbound tourism in the Republic of Belarus. The enterprise was created on the 9th of August 2007 in Minsk with the aim of granting an online booking of tourist services. Convenience, rapidity, relevance of information and accuracy in trifles are the basic principles of work of our company. "Company mission - the establishment of the national tourist product, the introduction of the most advanced information technologies in the organization of rest in Belarus, providing high service level for customers with any income rate." "The company's goal - improving the quality and competitiveness of tourism services on the market of inbound and domestic tourism in the Republic of Belarus." PRPUE «Automated tourism technologies» - modern Belarusian touroperator, which offers a full range of tourist services of hotel booking to organization of combined tours, business conferences and meetings, sports events in the Republic of Belarus. 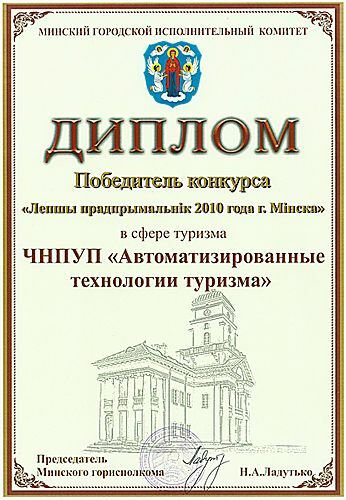 High standards of customer service, verified for 11 years of successful work, the introduction of modern Internet technologies, the use of the latest communication means at work with clients, the creation of convenient and intuitive process of booking tours, contractual relations with all recreation facilities at the territory of the country - gives us the opportunity to promote the tourist product of Belarus far beyond its borders. Today, with the help of the company «Automated tourism technologies» citizens of more than 100 countries of the world, including clients from the Russian Federation and other members of the CIS, Europe, America, Australia, Asia and Africa, estimated the diversity of Belarus. Every year, about 20,000 customers trust us to organize their rest in Belarus, they book tours online using 9 specialized Internet portals of the company. The specialists of the company can book any package of ground services in Belarus: vouchers to the health resorts, tourist complexes and recreation centers, farmsteads, hotel accommodation, regular group and individual excursions, hunting tours, transfer services, organize corporate events or business negotiations. All the diversity of tourism opportunities of Belarus is reflected in 9 specialized Internet portals, each of which is dedicated to a separate type of rest. Every Internet portals contain systematized information about the type of rest, which is accompanied by the abundance of actual photos and videos, background information and convenient search system. Up-to-date and convenient online booking system of tourist services in the form of electronic application and personal cabinet, which allows you to book tours in real time, track the status of the order, ask questions to the company's specialists at any time, conduct electronic document management and more. Every year more than 6 450 000 users visit the Internet portals of «Automated tourism technologies». Over the years, we have organized about 240 000 tours for customers from all over the world. Contractual relations with partners, the number of which exceeds 1 200 only in the Republic of Belarus, help us to create a high-quality tourist product. For the convenience of booking tours and communication with customers, we have groups and accounts in all social networks - VK, Odnoklassniki, Facebook, Twitter, Instagram. Our specialists will rapidly answer any question in the most popular mobile applications - Viber, WhatsApp, Skype, Telegram. Our company has the largest Youtube-channel about rest in Belarus. More than 6 000 videos about health resorts, health improving centers, recreation centers and farmsteads of Belarus cover a wide range of themes from scenic landscapes to unique videos about treatment methods in the health resorts and doctors interviews. Enterprise's forum consists of more than 51 100 messages from users and contains the most current reviews of guests about the rest in Belarus. At the forum, any visitor to the company's Internet portals can ask a question and receive a detailed answer from the spesialist on various topics, related to the planning of a tourist trip to Belarus. During ten years of work, the company's employees have made 1 000 business trips across the Republic of Belarus with the aim of collecting detailed information on recreation facilities. Today 82 500 photos of the health resorts, tourist complexes, recreation centers, farmsteads, hotels, attractions and museums are uploaded on our internet portals, and archives have more than 1 600 000 photos about the rest in Belarus. 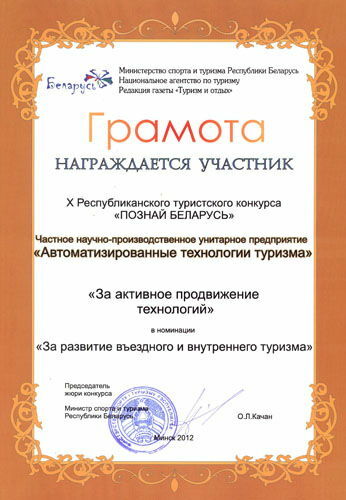 In 2007 PRPUE «Automated tourism technologies» team provided customers with a convenient and simple process of online booking for the first time in Belarus. Today, the up-dated online booking process consists of five simple steps, which, depending on the complexity of a tour, take no more than 20 minutes to complete. 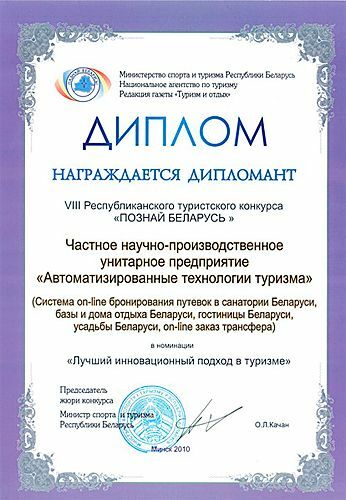 The Belarusian touroperator «Automated tourism technologies» is a team of professional specialists, who love their job. For 11 years we are dedicated to our job, we are opening the image of Belarus for the guests as an original, developed country, rich in its traditions. The history of our enterprise is a successfull story of a dynamically developing company, which has grown to the status of a national tour operator in a short time. The awards of the enterprise are an indicator of well-coordinated and precise work of all its departments, recognition of high achievements and professionalism, and the quality of provided services. 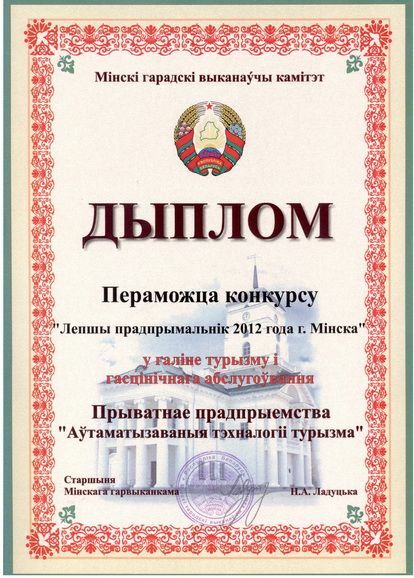 The Belarusian tour operator has a lot of republican awards in the field of tourism. In June 2017 «Automated tourism technologies» was placed on the Republican Honor Board for achieving high results in financial and economic activities. 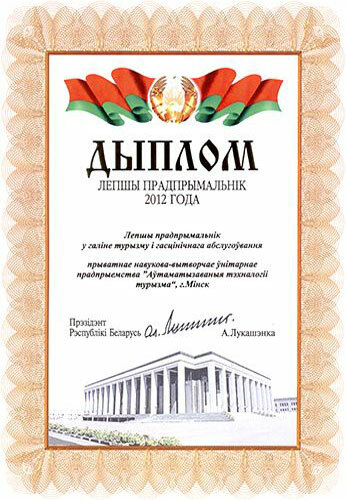 To learn all the awards of the Belarusian tour operator «Automated tourism technologies» go to the corresponding section. Nowadays, the company «Automated tourism technologies» is a young energetic team of professionals with higher education in tourism. The company's staff is 44 employees, united into 8 specialized departments, including 3 specialized sales department of the tourist product and web development and technical support department. To look detailed information about the staff go to the on the corporate Internet portal Att.by. All the achievements have become possible because of hard work of the team PRPUE «Automated tourism technologies» with clients, visitors of Internet portals and partners. The company occupies an open position in relation to travel agents and accommodation facilities, tour guides, the carriers and other partners. To start cooperation with company «Automated tourism technologies» is simple! Belarusian tour operator «Automated tourism technologies» office is located at: 220007, Republic of Belarus, Minsk, Surazhskaya str. 10, office 21 and works from 09.00 till 19.00 (Monday - Friday). You can get detailed directions to the office here. Contact information is presented in the section Contacts. Book online wellness tour in the health resort, sightseeing tour across Belarus, hotel room in one of Belarusian cities, tour for a weekend at a tourist complex, country farmstead, sports tour or a business event. In addition professional consultation on booking and payment of tourist services you can get by sending the message from the website or in mobile apps, forum discussions or in the office. It's time to rest in Belarus!